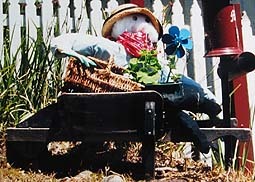 This scarecrow gardener looks colourful and attractive with her flowery sunhat and the small garden at her feet. 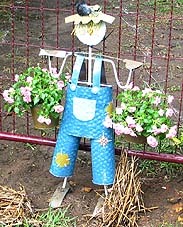 Here is a cute scarecrow idea for a miniature metal gardener carrying two baskets of flowers. And this scarecrow display has been prettily decorated with glittering CDs and giant flowers. 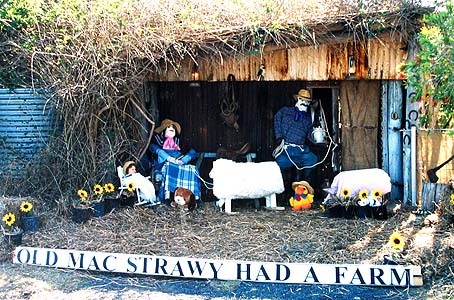 This Old MacStrawy Had a Farm display featured farmer scarecrows, Ma and Pa, along with a scarecrow horse, a scarecrow sheep, a scarecrow pig and many other smaller animals. 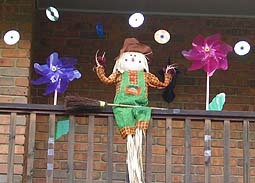 Note: This page includes gardening and farming scarecrow ideas for you and your kids to make: scarecrow gardeners, a scare crow flowery maiden and scarecrow farmers.